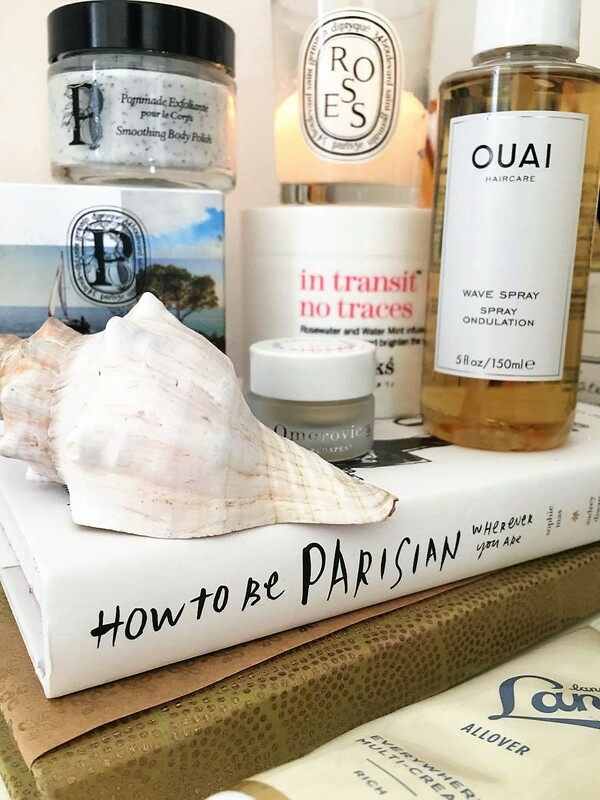 As a self-confessed hoarder of all things beauty, there isn't a month that goes by without a few new product purchases to try out and inevitably become addicted to. 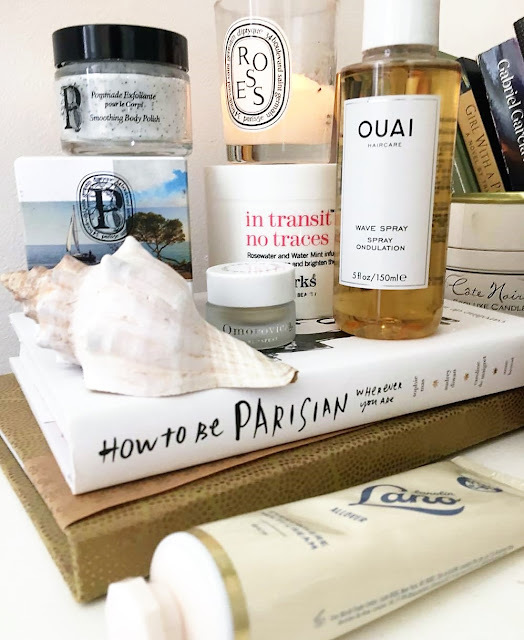 August was no different and thanks to a Space NK voucher, most of the purchases were slightly more indulgent than they should have been..
Diptyque is one of my most coveted brands and to me just epitomises luxury and indulgence in the candle world. Since their skincare launched this year I have been longing to try something from the range but with no birthdays or Christmas in sight, a travel-size was all my budget could handle. Firstly, the packaging alone is seriously pretty and not a box I will be throwing away anytime soon. Exfoliating skin products are one of my favourites to buy as I know they are going to make such a difference to the texture and finish of my skin. As expected, it is nourishing yet effective in smoothing the skin's surface and smells like something straight out of a spa. If it's good enough for the Kardashian's, it's gotta be worth a go, right?! Hair stylist to the stars, Jen Atkin, created the luxury OUAI brand with classic and effective tags firmly attached to the range. 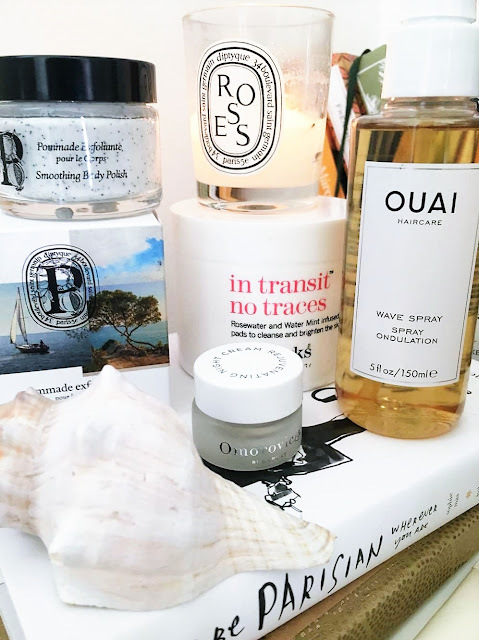 The Wave Spray is one of Ouai's bestsellers and promises to answer all my beachy-looking hair goals. I thought it would be more like a serum (which can leave my hair oilier than before washing) but the formula is weightless and non-greasy. It really helps to create un-done, separated waves and I find myself reaching for it all the time (it may look full but I've used it 5+ times so I'm thinking one bottle will last a whileeee). I'm sold on the brand. I've had these for ages and I'm finally down to the last few. I've loved using This Works products for years (the Sleep Spray in particular) and these are no exception. 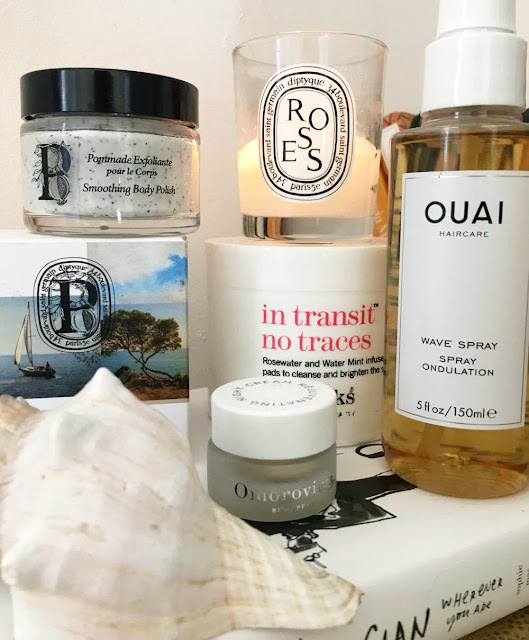 The In Transit range is aimed at skincare for long-haul journeys but I find this pot a little too big to travel with (the travel-size version would be more suitable) so I tend to use them at home when my skin needs that extra step of TLC. Rosewater and mint infused; they smell and feel so refreshing. I also highly rate the In Transit Camera Close Up moisturiser for thirsty skin. A quick disclaimer - I don't own this in full size and I don't know if I could ever justify spending over a hundred pounds on a night cream.. Nevertheless, the sample I have of this product is making it hard for me not to want this. The formula is so buttery and hydrating, so soothing to put on before you go to bed and feels so luxurious. Uh, why are you so expensive. A new brand that keeps cropping up on my radar when scouring the shops, the Lanolips range is extremely cute and hard to resist. Their multi-purpose cream is a hydrating potion for every skin qualm under the sun; you can use it on your face, body, hands, baby.. I do find it a little too thick to use on my face but it is so nourishing and a miracle-worker for dry skin. Very good value and a hand-bag essential. What did you try in August? I love lanolips, the lemonaid one is amazing for dry lips.